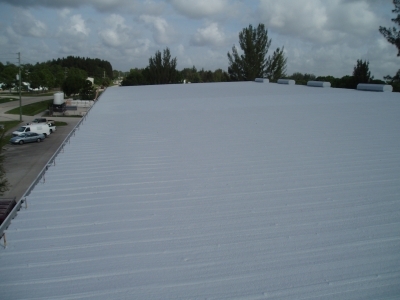 Located in the heart of Stuart’s industrial area, this two story butler style metal warehouse received a new coated foam roof system in 2004. 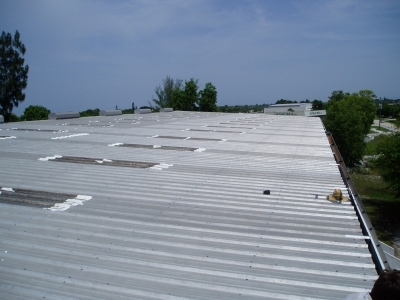 The existing metal roof deck had areas of serious rust and many of the fastener holes were allowing water to leak into the building. The flat fiberglass skylight panels were replaced with metal deck panels and the whole deck was primed and treated before SPF was applied. The roof was then coated with elastomeric coating. Surface Area: 22,000 sq. ft.